The closest lodging options are shown below. Students have also found nearby lodging through Airbnb. Tourism Victoria can recommend other choices, and advise you about special discounts around town. There is a good bus system, so its easy to get around greater Victoria and see all the sights. Busses #2 and #8 stop ½ block from the Sound Sanctuary. The closest airport is Victoria International (YYJ). It's a 30-45 minute drive from The Sound Sanctuary. ​I personally checked out this charming B & B that is just a 2K walk from the Sound Sanctuary. Rates include a hearty breakfast. Beautifully redecorated under new ownership! "Enjoy the tranquility of a traditional English home in the heart of Oak Bay Village, steps from the Sea, yet just minutes from the hustle and bustle of Victoria’s Inner Harbour." For walkers, bird watchers and cyclists, staying at the Oak Bay Guest House means easy access to Oak Bay’s beautiful vistas – Cattle Point, Willows Beach, the Victoria Golf Club and Uplands Golf Club." The Oak Bay Beach Hotel is about 5K from the Sound Sanctuary. "Experience elegant, luxury suites, expansive ocean views, refined dining in The Dining Room, a morning coffee at Kate’s Café or a local pint and quality conversation at The Snug pub. Or, simply relax by the ocean in our hot mineral pools or seaside spa." Tourism Victoria can help you get hotel reservations at special rates, get discounts on local attractions, recommend restaurants, local events and give travel information. They say, "Victoria is a unique blend of old world charm and new world experiences. As an island destination, Victoria offers visitors an escape from the hurried world and beams with ambience. In Victoria, heritage architecture, colourful gardens and traditions like afternoon tea mix with a plethora of outdoor adventure, authentic culinary experiences and an enviable cocktail and craft beer scene. Boasting the mildest climate in Canada we are green and beautiful year-round. In fact, Vancouver Island, where Victoria is located, is rated the top island in the Continental US and Canada and one of the top ten islands in the world by the 2014 Travel+Leisure World's Best Awards. 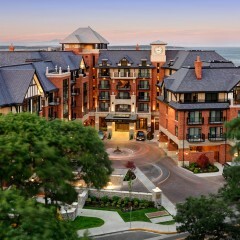 We were even rated as the #1 DESTINATION TO VISIT IN CANADA by the 2010 TripAdvisor Travelers' Choice Awards."